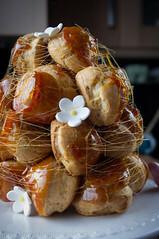 Week seven of the Great British Bake of saw the bakers tackle puff pastry and create three different sweet pastries in four hours for their showstopper challenge. Something I really didn’t envy them doing in that time limit and something I definitely would have struggled to complete. However, there was no doubt that I would be inspired to make something with puff pastry, and I definitely wanted to make these babies. They were a staple in my household growing up and my Dad would always buy some at least once a week. As an adult I very rarely eat custard slices now, I think its actually been years! Forget the rubbery custard you get in the shop bought ones, these ones use a smooth, vanilla bean enriched creme pâtissière which is made all the more richer by using whole milk and double cream. This is sandwiched between layers of crisp buttery puff pastry and topped with water icing. To cut through the beige I added a layer of raspberry coulis and I think this set the whole thing off perfectly. Crisp, creamy, sweet and a nice hit of sharpness from the raspberry. I won’t lie and say these are easy to make. They’re a ball ache. 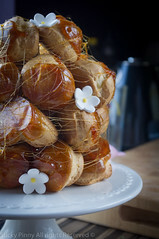 The pastry and the creme pâtissière are effort in themeselves, then add on the work needed to bake and assemble I was ready to write this off as a bad job. 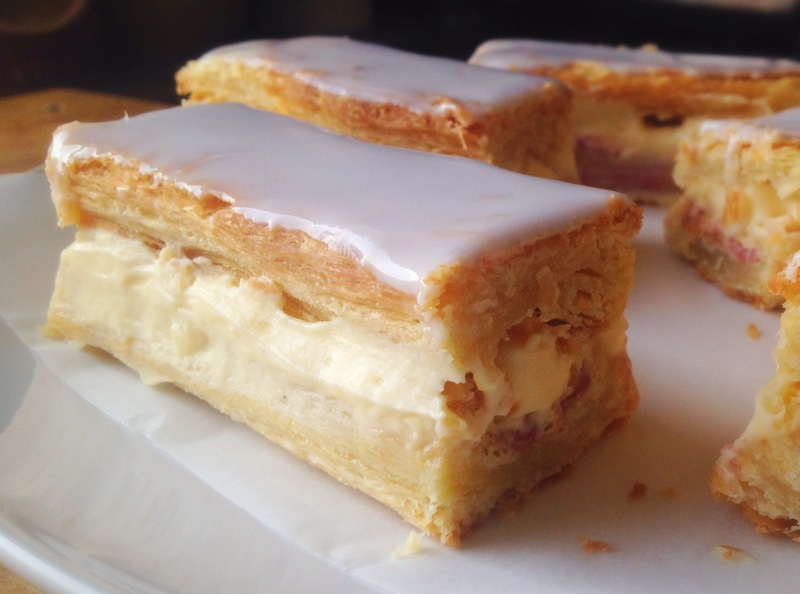 My control freak, mardy side had a moment – I thought these custard slices looked shabby and rough. The could have looked more polished. I was annoyed. I realised horror of horrors, that my inner Ruby (This will mean nothing to those who don’t watch the Bake Off) came out. Aside from the small stupid meltdown, looking now at the photos these actually look pretty good and taste a million miles away from the ones I remember. Note to self, don’t be a ****. 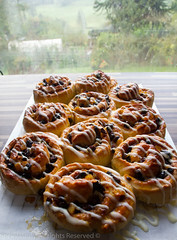 Not that I want to put anyone off making these – they are really rewarding and taste great. The Husband ate two in ten minutes so they must’ve been good. If you don’t fancy making your own pastry, then use an all butter shop bought variety – I’m not going to get all evangelical now! 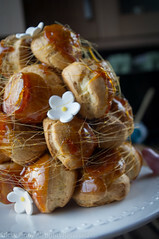 What’s your favourite sweet puff pastry? I’ve now got designs on apple turnovers! Heat your oven to 200c / 180c fan. Roll out your pastry into a square about 5mm thick. 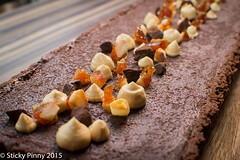 Cut this into 6cm wide strips and lay them on a lined baking tray, with about an inch space between. 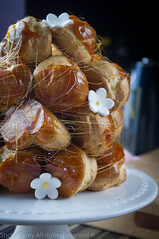 Prick all over each piece with a fork – this will help contain the rise of the pastry. 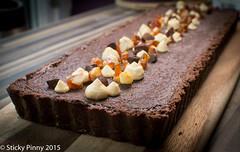 (You could also bake the pastry in between two baking trays to keep a consistent, even thickness). Bake for about 18 – 20mins until the pastry is golden brown and cooked through. Leave to cool. Now make the custard. Add all of the ingredients into a saucepan with the exception of the butter and and whisk until combined and no lumps remain. Set the pan on a medium heat, then add the butter. WARNING – you need some strong arm muscles for this. Keep whisking over a medium heat until it reaches boiling point, You’ll know when this is the case as the custard will thicken. Once very thick and smooth, decant into a bowl and cover with cling film. Leave to cool and then chill in the fridge. Once cool, its time to assemble. Apply a layer of coulis / jam (this is optional), then thick spoonfuls of the cooled thick custard to half of the pastry strips. Lay each of the other strips, bottom side up so you have a nice flat top, onto the custard topped pieces. Be gentle and try as best as you can to not let the custard ooze out. Use a palette knife to smooth / push any custard filling back in. Once assembled chill whilst you make the icing. 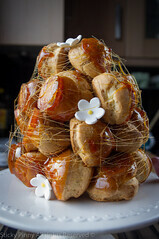 Mix the icing sugar and water then spread over the tops of the pastry. Chill again so the icing sets. Once set, slice the lengths into portions using a small serrated knife – the trick is to be gentle, saw into the top layer of pastry, then continue down. You should end up with some neat looking slices. Try not to eat them all in a 24 hour period like we did! Baking keeps you out of the bars and out of trouble! The slices look amazing! Thank you, hard to resist – gonna have to be seriously good this week! Thanks, they take time but taste great. Banish that inner Ruby they look great. 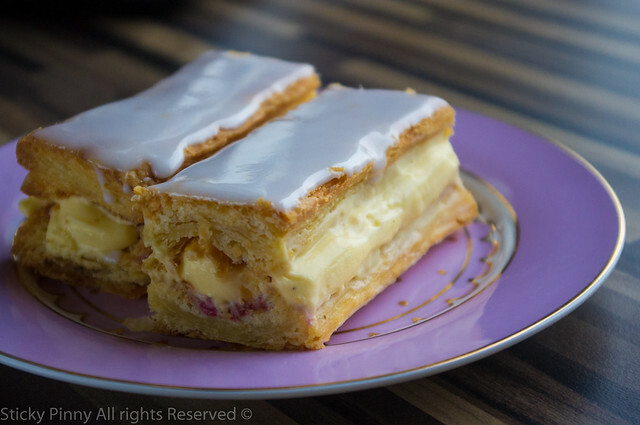 I had a vanilla slice for the first time in years last week & realised what a beautiful thing they can be. 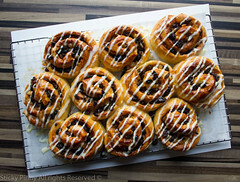 Next time I am in a baking mood I am going to have a go at these. Consider her banished. They tasted great, although my waistline isn’t thanking me for it! They look perfect! I’ve been meaning to make these for ages. I might just give them a go soon. Thanks, I have designs on fruit filled variations…. watch this space!